Today's laminate flooring so closely resembles wood, you'll have difficulty spotting the difference. An accolade to current manufacturing technology, laminate flooring continues to make pioneering breakthroughs. It now conveys the genuine look of hardwood or ceramic tile. An assortment of shades and finishes allows you to choose the hardwood look down to the species and now, laminate flooring is mimics hardwood even more. Shaw Laminate Flooring Touchable Texture offers beveled, distressed, and extremely textured options to give your laminate wood flooring the appearance and feel of true hardwood, wood grain and all. 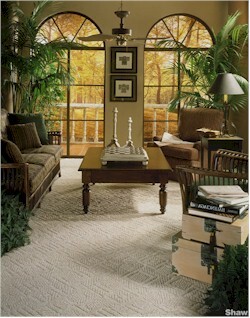 Use texture to add a distinctive touch to your home or choose a distressed style to provide economical beauty. 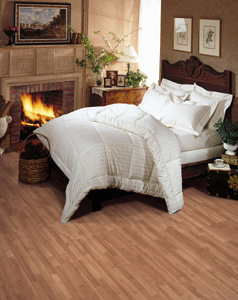 Shaw Laminate Flooring is manufactured in layers to create enduring, affordable, attractive flooring. Four layers of material, each with its own purpose, are merged together to create laminate flooring that is tough and will last for years to come. Layer 1: A melamine backing layer provides a moisture barrier and structural integrity. Layer 2: Shaw Laminate Flooring adds Moisture Seal within an ultra-dense core board to provide even more structural stability and moisture protection. Layer 3: Beneath the top layer is the decor layer featuring natural wood designs. Layer 4: A melamine wear top layer offers a tough, beautiful finish. Shaw Laminate Flooring meets all of your needs. Whether it's a quieter step or easy laminate flooring installation, Shaw laminate is durable, affordable, and easy to maintain. Shaw Silent Step: An exclusive underlayment, Silent Step provides comfort and stability while offering moisture resistance and noise absorption. VersaLock: A patented locking system speeds up installation and offers the latest technology. It even allows you to install your laminate flooring without glue or nails. Touchable Texture: Offering a true-to-life texture, Touchable Texture is an innovation you can see as well as feel. Experience the pure ease of glueless laminate flooring installation with Shaw's unique VersaLock flooring system. This revolutionary product advancement enables quick installation without glue so there's no messy clean up and you can walk on it immediately. VersaLock is a patented locking technology that reliably secures the flooring panels on all four sides without adhesive. As an added bonus, a VersaLock floor is warranted against moisture damage and can be easily taken apart and reassembled. If laminates looked fake the last time you checked, check again.